Tystar's gas control equipment provides precise control and mixing of industrial process gases used in the semiconductor manufacturing industry. The gas panels use compact, modular designs and are fabricated from 316 stainless steel with orbitally-welded joints and connections. They are leak tested to 10-8 cm3/s with helium. 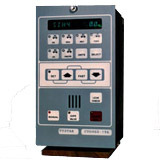 The MFS 460 Electronic Gas Controller provides safety interlocks and other critical gas control features.